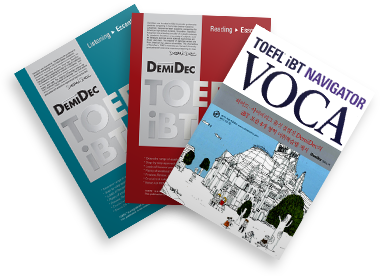 Published in 2007, DemiDec’s new guides bring to TOEFL preparation the same approach that has helped students in the United States succeed in Acadec for thirteen years. Each series—Essential and Advanced—includes four books, one for each section of the TOEFL iBT: Reading, Writing, Listening and Speaking. All eight books combine test-taking strategies with extensive practice drills and tests, while accompanying CD-ROMs accurately simulate the TOEFL iBT experience. Course instructors may also wish to purchase the corresponding casette tapes for classroom use. DemiDec's new TOEFL vocabulary book contains over 3,000 words that frequently appear on the TOEFL, divided into sixty thematic units so that readers can learn words in context. Review exercises, exams and an audio CD containing pronunciations and definitions are also included. DemiDec's TOEFL guides can be purchased online from Aladdin.co.kr.